Si prega di inviare una e-mail (matchboxprojects@gmail.com) o il testo +61 410 331 600 per organizzare un momento di incontro per consegnare la vostra scatola di fiammiferi. Amici e familiari sono invitati a prendere una scatola di fiammiferi e far parte del nostro viaggio. 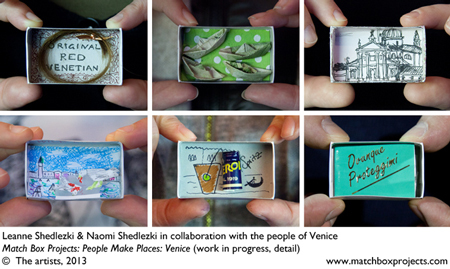 Please e-mail us (matchboxprojects@gmail.com) or text +61 410 331 600 to arrange a time to meet to deliver your own Venice matchbox impression. Friends and family are also welcome to pick up a matchbox and join our journey. This entry was posted on Friday, January 10th, 2014 at 7:50 am	and is filed under Our Blog. You can follow any responses to this entry through the RSS 2.0 feed. You can leave a response, or trackback from your own site.